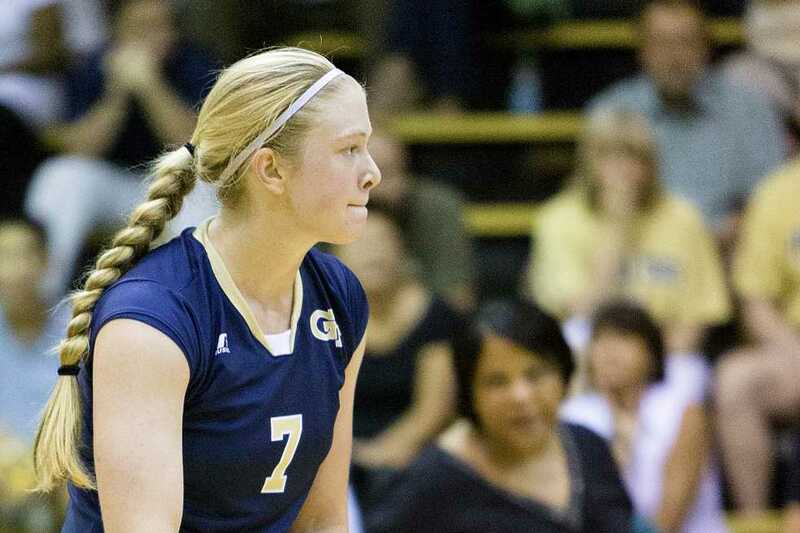 Annika and Teegan Van Gunst are two of the newest members of this year’s volleyball squad. Hailing from Fayetteville, Ga., these six foot tall freshman twins hope to contribute greatly to the team. “To be starters, to make as much of an impact as we can on the court is a huge goal for us,” Annika said. They always planned to play together on the same college team. “We had offers from different schools, but it was automatic; we didn’t want to separate, so that was a major requirement when we were looking for schools,” Annika said. “It was a packed house, and the intensity [just made me] want to play here,” Annika said. Anika and Teegan have been playing volleyball together since they were in the seventh grade, so they surely have developed a great deal of chemistry in that time. “Volleyball in general takes a lot of communication between the players, and we’ve played so long together that we can anticipate what each other is going to do, and we don’t get in each other’s way. Call it telepathy or whatever,” Annika said. “It flows more naturally between us two…” Teegan said. “…because we’re so used to being together,” Annika finished. They are also not afraid to be critical of one another, and concede that they have formed somewhat of a sibling rivalry. “We know what each of us are capable of, so we’re always on to each other about being the best that we can,” Teegan said. They admit that it took some time to adjust to the speed of the game at the college level. “That was something new, being freshman. You have to get used to the fast pace,” Annika said. Both Annika and Teegan were varsity letterwinners all four years at Whitewater High School, where they won two state championships. Their list of high school accolades is well populated; Teegan was once the 5A State Player of the year, while Annika was the 2012 All-Area 5A MVP. Their athletic success is not just limited to volleyball either, as both players are highly skilled in soccer as well. “We contemplated playing [soccer] in college also, so it’s definitely my number two [sport],” Annika said. They picked volleyball over soccer mainly because they wanted to go to Tech, and Tech does not field a soccer team. So far both of their majors are undecided, though they are swinging towards engineering. “I would definitely say [we’re leaning towards] engineering, maybe mechanical or industrial.” Teegan said. “We like the math and science; that’s our strong suit,” Annika added.